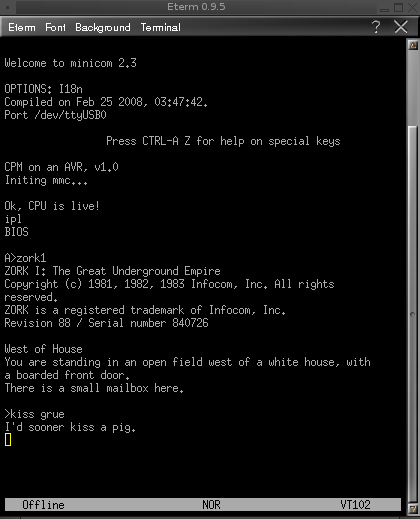 In the end it took quite some hacking, but the result is nice enough: I can play Zork on an AVR! It's... not really quick, though. The time from bootup to where I took this screenshot is about 30 seconds. Ofcourse, stuff like memory and SD-card-access could be optimized a bit more by e.g. adding a bit of cache, but I'll never get the same speed as the original: the AVR is just too slow to handle the realtime emulation needed, just as expected. The emulation isn't completely 100% either: some programs tend to crash or act up, most of the Z80-specific instructions aren't emulated yet and the BIOS still bugs now and then. I was actually thinking of solving these problems and including more functionality like an integrated VGA-out and keyboard in, and maybe using disk-images instead of raw SD-cards... but then I stepped back and remembered I was writing a proof-of-concept emulator for a system that's already emulated a hundred times better and faster on a random PC. Anyway, in case you want to build this curiosity by yourself or just want to see the sources: as usual, it's all licensed under the GPLv3 and downloadable here. I'd, as always, appreciate a message or email if you actually manage to do something useful with them. It's same like Pseudo disk for apple II card. So I think it's become for SS-50 or ISA bus interface more better. Do you think so? Since SD cards have WAY more capacity than any disk available in CPM days, I would just use 128 bytes of each 512 byte SD card sector. Yep, wastes 3/4 the capacity of the card, but who cares. Should also be faster and cause less wear to the SD card... no need to do those read-modify-write cycles. LWATCDR: That's not really possible, the AVR isn't able to execute from RAM and re-flashing a bit of memory every time the program would drop to avr-mode isn't feasible either. The 'peripherials', however, work in a way that minimuize the amount of BIOS-code needed, so there's not too much to gain there anyway. A trick you could use would be to create an opcode to drop into AVR mode. That way you could write the BIOS in AVR asm and gain a little speed. Really a fun little project you did. Ivan: Sure, if you change the firmware you could even use core memory as the RAM... just write the drivers. Any other DRAM-chip with about the same specs as the GM71C4256A will work too, though, just raid an old XT or 286 mobo or some 30 pin SIMs. Too difficult to find DRAM GM71C4256A. Can use SRAM instead? Chaging firmware emulator? As I am a bit older, CP/M-80 was the first OS I got to know. And many times I have been considering to do what you did. Zork brought back the memory of a large piece of paper being te result of many nights playing the game. Wow. And you say it is not quick; a 2MHz 8080 and 8-inch floppies (with head loading klunk!) may well take more time to boot. Thank you for the smile you've given me! Simon. Great Work! Sounds interesting! I am keen to try it myself.... Perhaps with another chip .... ARM or something like that. Fantastic piece of work. I also started out with just 8080 emulation on the Propeller chip. All you need for CP/M. After some encouragement from the Parallax forum folks it became a (almost) full Z80. Since then Pullmoll there has done a full Z80 on the Prop. If you want to shake out the last op code bugs the SIMH AltairZ80 project has CP/M disks with an instruction set test program EX8080.COM. Find it here: http://www.schorn.ch/cpm/intro.php Lots of other good CP/M stuff there also. If you connect a atmega32 terminal to it, it would be nice. Check http://www.sbprojects.com/projects/apple1/a-one-terminal.htm Compiled with SB-ASM. Great work ! I have often thoght of a "Z80" emu on an AVR. I follow the Propeller emus and keep thinking of using an old DRAM instead of latched statics (the lack of interupts makes refresh tricky, to my "brain") I am planning to try an old EDO chip, then perhaps a SDRAM if any of it works. The AVR will suffer overclocking I once push a 20MHz 168 upto 32MHz by mistake (at 5V)instead of 16MHz, It gave four little pictures on the monitor. Crisp: Hmm, I didn't know that, thanks :) abraXxl: I don't know off the top of my head, but it emulates a 64K machine, so you should have the maximum TPA CPM2 allows. Hi, cool idea. I like too build that too. How big is the TPA in your emulation? Congratulations. Quite an achievement imho. Michael: Theoretically, yes. I read that not too many cards actually support that command, though, so I decided to optimize for compatability and keep the blocksize 512bytes. Isn't it possible to use SET_BLOCKLEN (CMD16) to change the block length read/written to 128? Or is there something I've overlooked? Either way, this is a really neat project!